Garbage disposals—sometimes called garbage disposers—are a cook’s best friend, grinding up and washing away kitchen refuse with the touch of a switch. 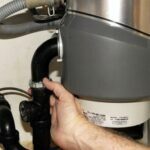 If you are in the market for a new garbage disposal, this garbage disposal buying guide will show you that choosing one is a very simple process because your choices are limited. 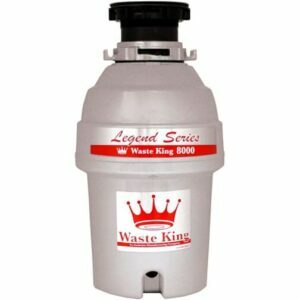 Top-quality garbage disposer offers 3/4 hp, insulated stainless-steel grinding components, and lifetime warranty. From an environmental point of view, garbage disposals have pluses and minuses. They help minimize the amount of garbage that is delivered to landfills, but, in doing so, they require using significantly more water and energy, and they can strain septic systems and sewage treatment facilities. A good compromise is to compost food scraps whenever possible and use a disposer when not. Garbage disposals are either continuous-feed or batch-feed. You turn on the continuous-feed with a switch as you run the water and can feed it food waste as long as it is running. The batch-feed type automatically turns on when you press a special stopper into the drain; this type is a little less convenient but is easier to install and safer because it cannot be operated unless the stopper is in place. All garbage disposals sold in the United States are made by only a few companies, though they are branded with several names. InSinkErator makes eight out of 10 of them, with consumer ratings favoring the Waste King and Kenmore models in their group. There are many models from low-end, low-power disposers that cost as little as $50 to top-end, full-featured models that cost $600 or more. Generally speaking, you get what you pay for in most regards. Top-of-the-line InSinkErator Excel disposer does fine grinding with power. Buy it now on Amazon. Power, for example, makes a big difference both in performance and durability. At the low end, you can buy 1/3-horsepower units, but we recommend that you spend a little more to get a lot more. Invest in a unit that delivers at least 1/2 horsepower if not 3/4 horsepower or, even better, 1 horsepower. Lower power models don’t perform as reliably, especially when grinding bones and hard food scraps and, as a result, are more likely to allow poorly-ground waste to clog pipes. They also don’t last as long. Higher power models will grind just about anything. With the top-end InSinkErator Evolution Excel, for example, the disposer has multiple grinding stages that will fine-grind food, and do their job exceedingly quietly. With these, you can practically liquify celery, corn cobs, chicken bones, coffee grounds, and much more. Though this top-end model lists at over $600, you can buy it online for hundreds less. Most garbage disposals interlock at the bottom of a sink’s standard drain outlet and are designed for easy connection. Various adapters and connection kits are available. They must be hard-wired or plugged into to a 120-volt receptacle with a 3- to 6-foot power cord that sometimes must be ordered separately. And they are connected to a drain pipe. 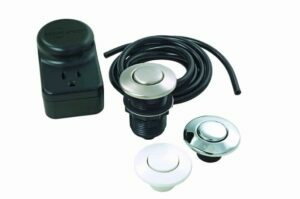 Garbage disposal air switch can be mounted in a hole in the countertop or cabinet frame. Shop Now! Continuous-feed disposals also have switches, which may be either electrical, wall-mounted type or countertop air-pressure switches. Though electrical switches placed along the backsplash near the sink are very common, air-pressure switches are safer for guarding against shock because they isolate the electrical system away from the sink area. They’re also a lot easier to retrofit because they don’t involve running wires in the wall. Batch-feed models don’t require a switch because they start when you insert and turn a special drain plug. Because of electrocution hazard, local safety codes determine the minimum distance an electrical switch must be located from the sink; the farther away, the safer. Generally, the larger and heavier the disposal, the more quietly it will run (but be sure the one you choose fits under your sink). You do, however, need to make sure that the disposal you choose will fit comfortably under your sink. Though manufacturers have attacked unnecessary garbage disposal noise with a vengeance, even the best disposal will never be whisper-quiet. In fact, under certain sinks, such as stainless steel, they can be quite noisy because of the vibration they cause. The best impellers (the blades inside) are stainless steel. An insulated, nylon grinding chamber, such as Waste King’s is quiet and corrosion-proof. 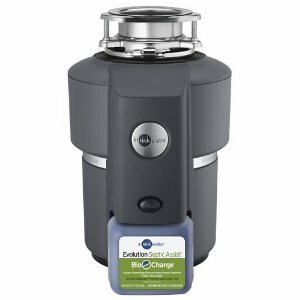 For homes with septic tanks, this disposer injects microorganisms into the chamber every time it grinds. Garbage disposals can be rough on a septic system because they expel wastes that are difficult for the microorganisms in the septic tank to digest. The InSinkErator Septic Disposer features a new injection technology that injects citrus-scented natural microorganisms into the grind chamber every time the disposer is activated. the dispensers clip right onto the front of the disposer. When they run out, you can buy replacements for under $20. 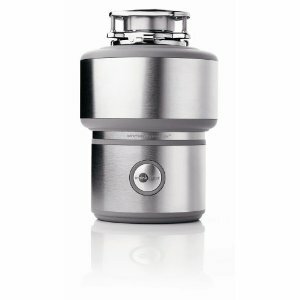 This disposer lists for about $400 but can be bought online for much less. A good disposal can last for many years, especially if you avoid clogging it with such fibrous foods as celery, potato skins, melon rinds and other fruit and vegetable peels, eggshells, and coffee grounds. Warranties run from one year to the lifetime of the purchaser. The best-of-class warranty is a lifetime mechanical and corrosion in-home replacement warranty. 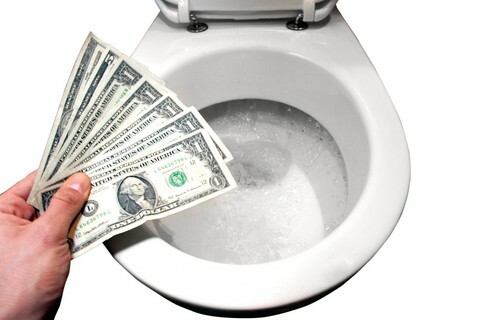 Offered by Waste King, a disposer protected by this will be replaced in your home if it fails due to mechanical or material defects within the lifetime of the original purchaser. The high-end InSinkErator Evolution has a 7-year in-home parts-and-labor warranty.